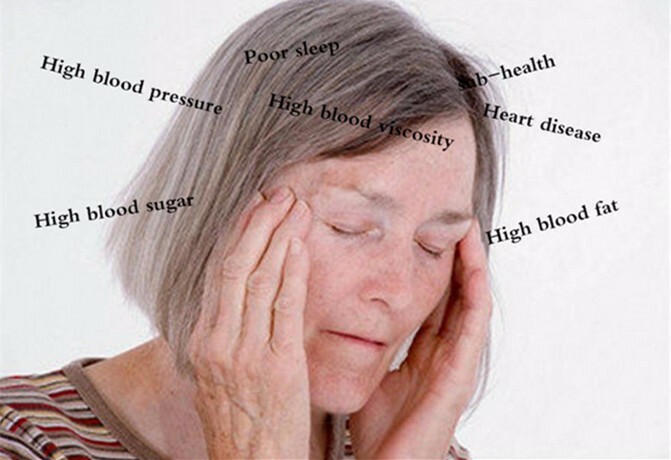 Are you or your family suffering from the following diseases? Along with the age growing and changes of our life style and living environment, there are more and more fat, cholesterol, lipid garbage in the blood. Our blood viscosity become higher and higher (hyperlipidemia), then cause atherosclerosis. So it'll be hard for red blood cells to transport blood, oxygen and kinds of nutrition to our organs. The metabolism become difficult. Finally cause a lot of dieases such as high blood pressure and diabetes. 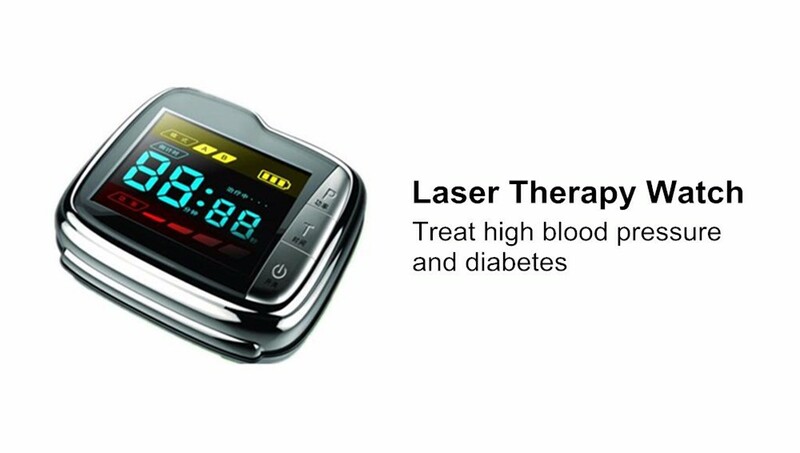 What diseases can Laser Therapy Watch treat? 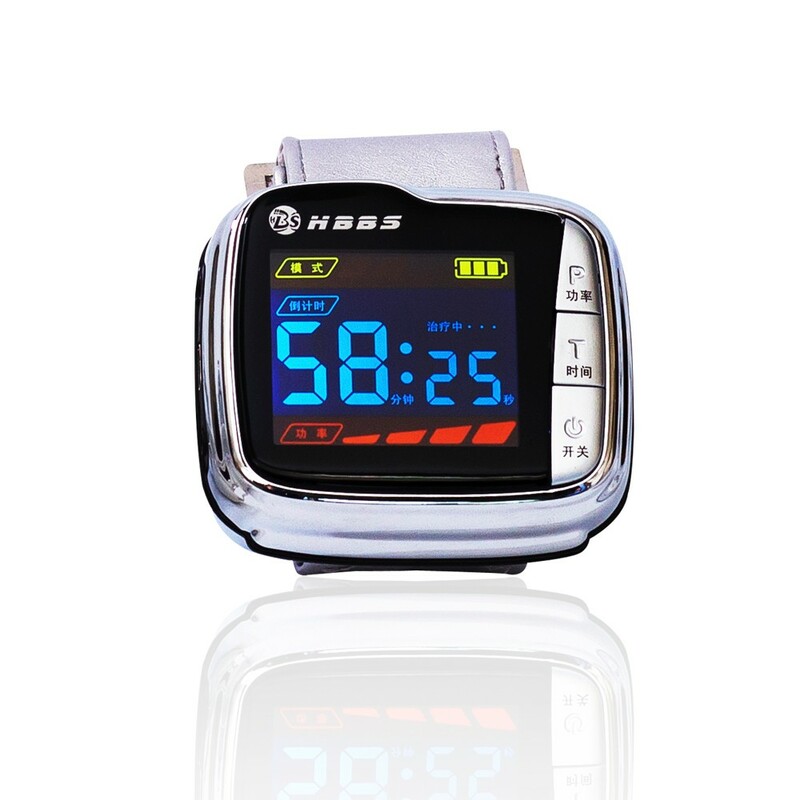 What features do Laser Therapy Watch have? 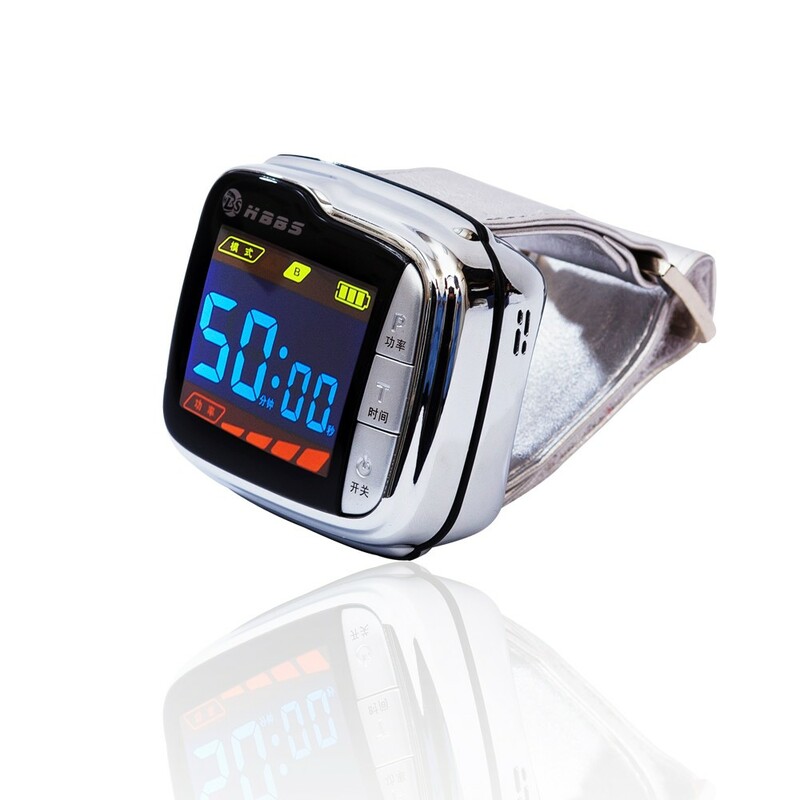 It adopts 650nm laser to irradiate the acupoint. It will penetrate our vessel wall. 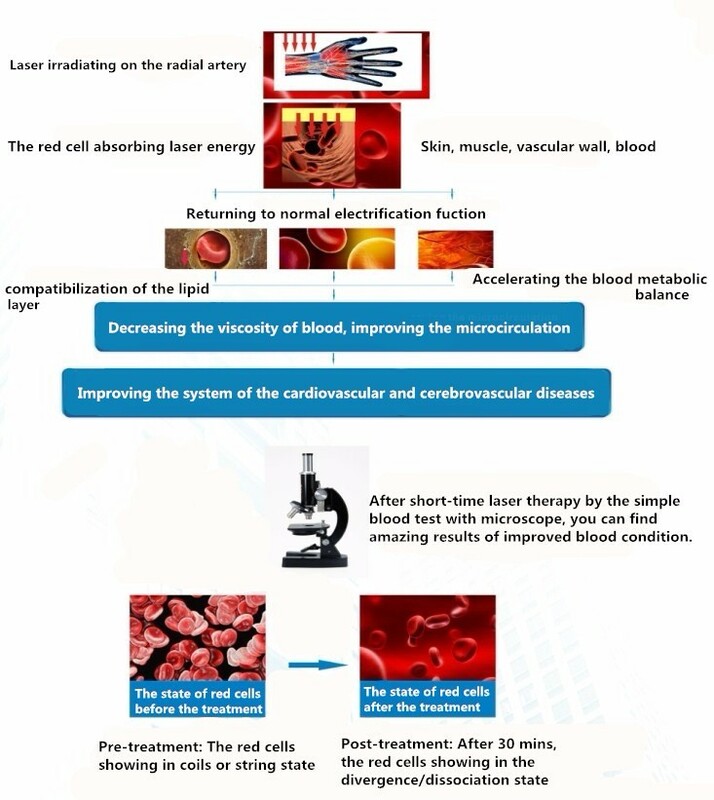 We can absorb the laser energy to produce the lipoprotein lyase, the lyase will decompose the fat garbage in the blood so that improve the microcirculation. 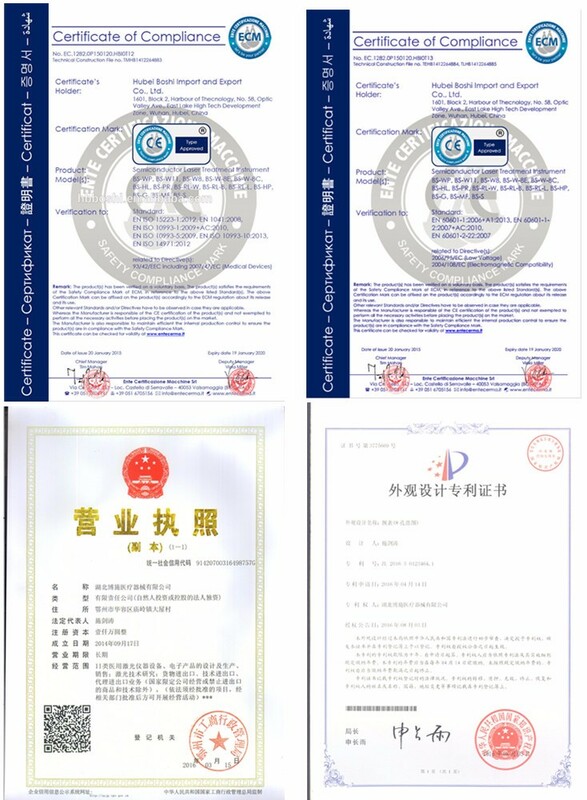 Meanwhile it can improve the red blood cell carrying oxygen capacity so as to purify the blood, improve the islet function, make the insulin secretion reach normal level. Finally lower the hyperlipidemia, hyperglycemia, hypertension, treat high blood pressure and diabetes. 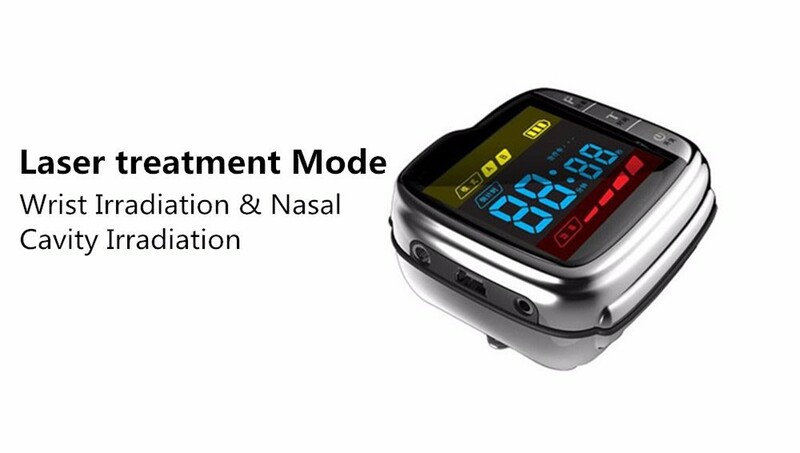 It adopts 650nm laser to irradiate the damaged nasal mucosal tissue. It can activate and repair mucosal cell, speed up blood circulation, and help to absorb inflammatory exudation and edema, fundamentally improve immunity and metabolism to treat kinds of rhinitis diseases. Meanwhile since our nasal cavity have large number of the capillary, it's more easy to stimulate the nasal nerves, improve the skull blood circulation and the whole microcirculation. It can transport more oxygen and nutrition to our brain. Finally treat cardiovascular and cerebrovascular dieases such as cerebral thrombosis, stroke, sudden death etc. Through the microscope we can observe the red cells activated, it appears single and back to normal. Headache, dizziness, chest tightness, shortness of breath, palpitations, drowsiness, insomnia, numbness, memory loss and other symptoms change or disppear. User tests changes in blood flow, blood tests, blood viscosity, cholesterol, triglyceride, low density lipoprotein, or other indicators fall back to normal. Effectively improve and treat some diabetic, specially type2 diabetic sufferer. Effectively the balance of their pancreas function. Long-term using will reject cardiovacular and cerebrovascular dieases, such as cerebral thrombosis, stroke and sudden death etc. 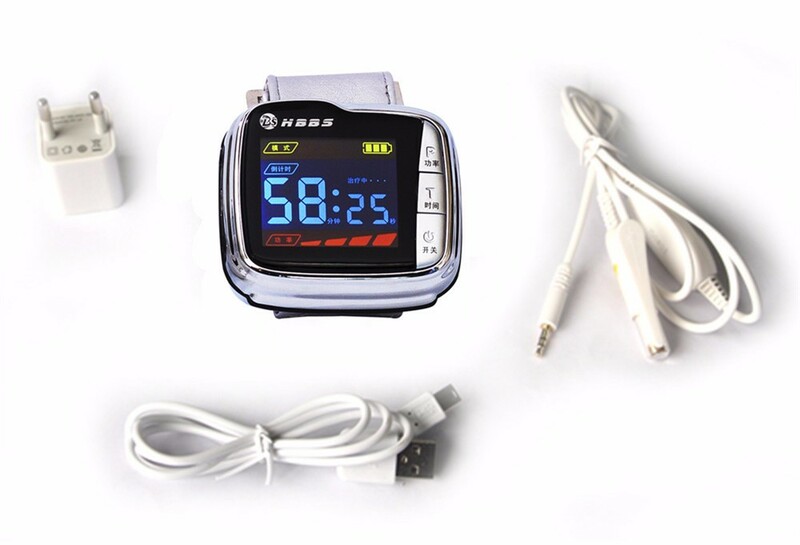 How to wear Laser Therapy Watch correctly? 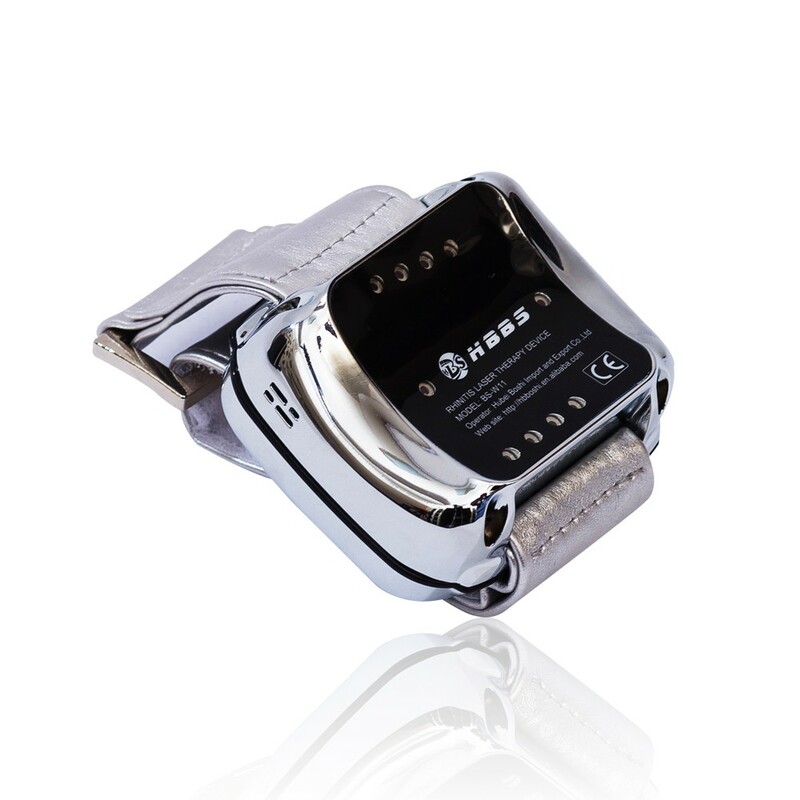 Wear the main machine on the inner side of the left wrist, and keep the key surface of the main machine parallel to the first cross grain, so as to ensure the laser irradiates radial artery and neiguan acupoint precisely, and then fasten the wrist belt without slide. 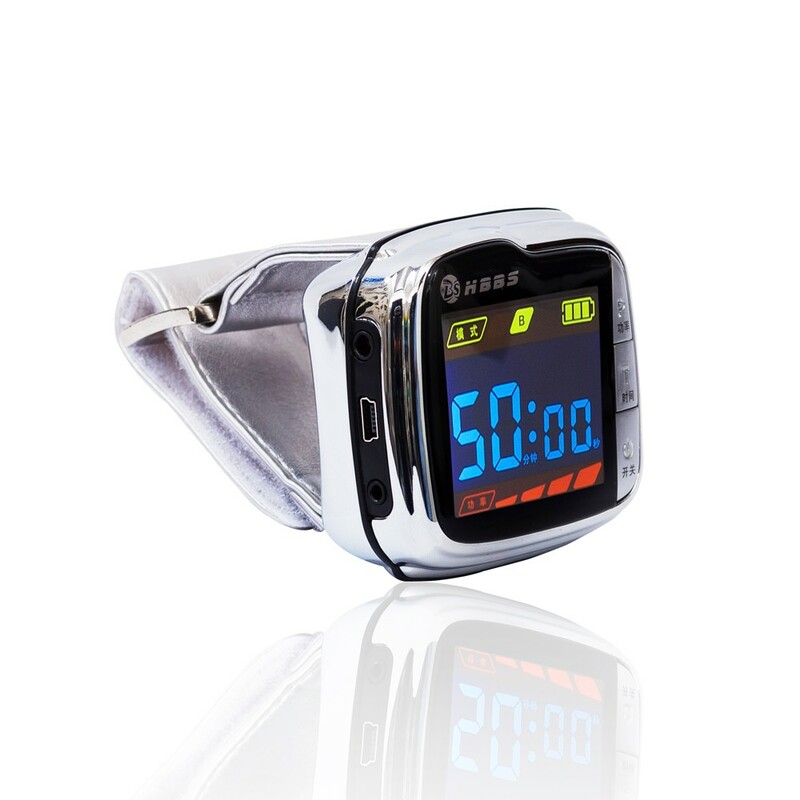 How often should Laser Therapy Watch be used every day? 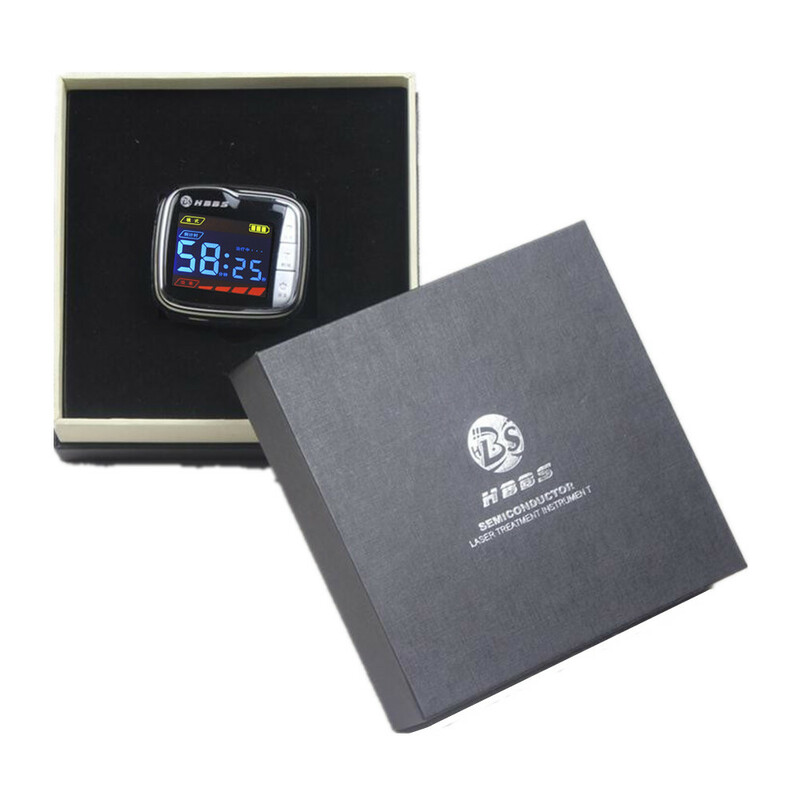 As for general users, two times each day, 30 minutes for each time, 10-15 days for one treatment course, 5-7 days intervals for each treatment course. During the treatment, drink more, eat more vegetables but less greasy and fried food. Why does Laser Therapy Watch irradiate radial artery? Firstly, the position of radial artery is more superficial compared with other parts of the body. Secondly, radial artery is closer to the heart and blood flow here is larger. Blood goes through the radial artery at per eight minutes. Thirdly, radial artery is easy to touch and locate, which runs along vein, so laser energy can be easily absorbed by blood cells to ensure good effect. Why does Laser Therapy Watch irradiate Neiguan acupoint? Firstly, Neiguan acupoint can adjust the abnormal heart rate in a bidirectional way, so the high heart rate can be slowed down and the low heart rate can be accelerated. Secondly, Neiguan acupoint can increase blood flow of coronary artery in acute myocardial ischemia. 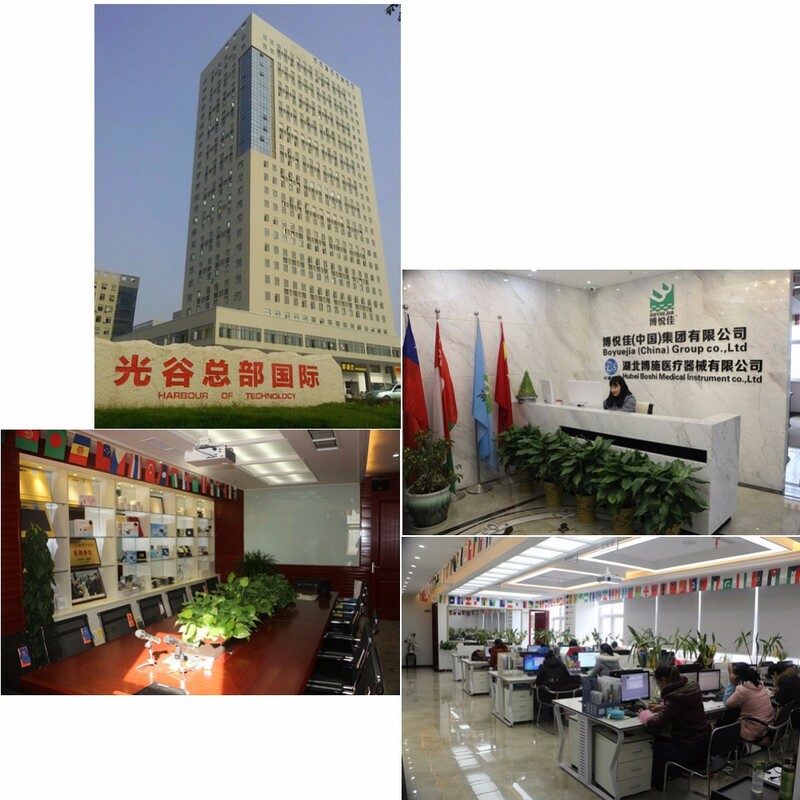 Thirdly, Neiguan acupoint can strengthen myocardial contractility and improve cardiac function. Why does Laser Therapy Watch irradiate nasal cavity? The location of nasal cavity is close to brain which is the center of human body. Abudant vessels and nerve systems are distributed under the nasal cavity. 60% blood flow of nasal mucosa goes through arteries and vein, and blood goes through nasal cavity at per three minutes. 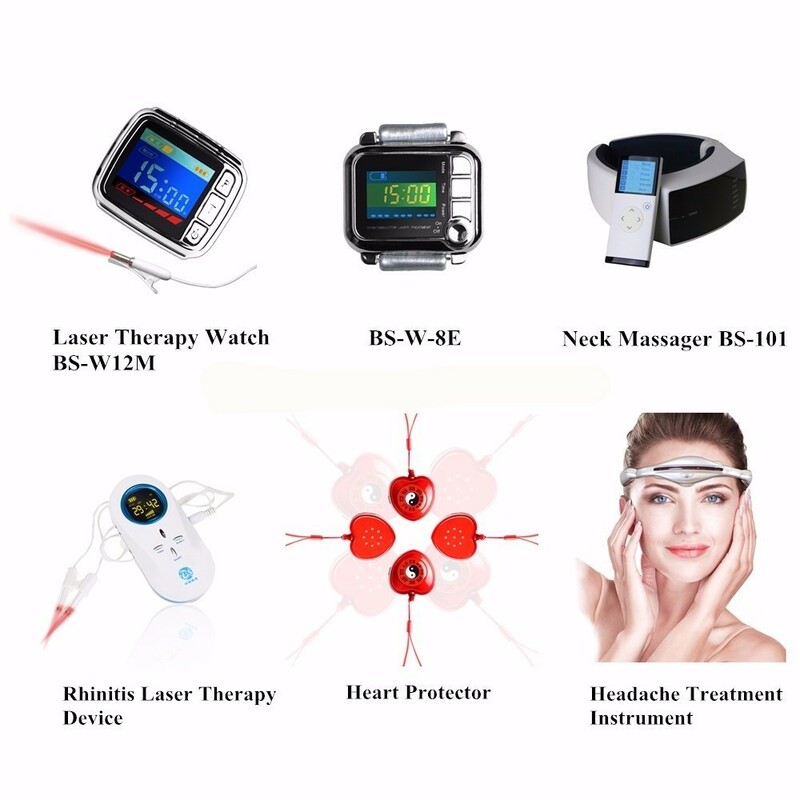 100% Guarantee on all our laser therapy device, beauty and healthcare equipment! 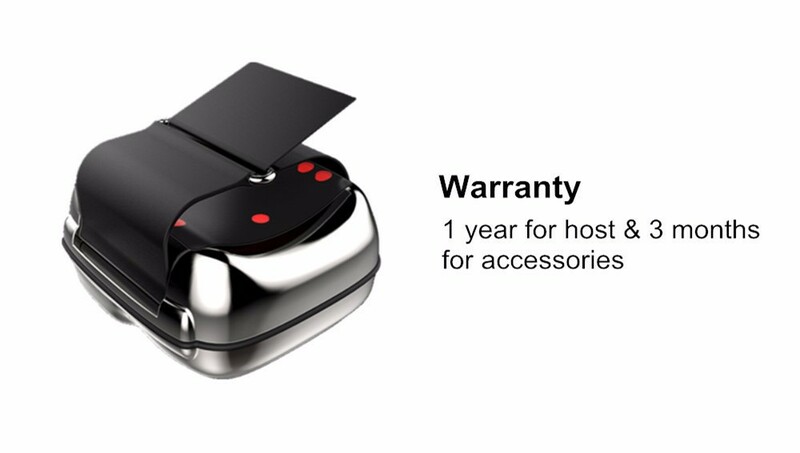 All machines comes with 1 year full warranty, but honestly we will offer you LIFE TIME free online advise, help and the best after sale service even after years, so if you buy the machines from us, We will always be there for you!